Today we proudly present a speciell guest, the hungerian giant Dávid Verrasztó, an IM superstar! 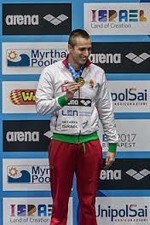 Dávid is specialized at 400 IM and has won five goldmedals and five silvermedals at Eurpoean Championships. He was also silvermedalist in Kazan at the World Championship-15. Welcome to Swim Open Stockholm 2017 Dávid!